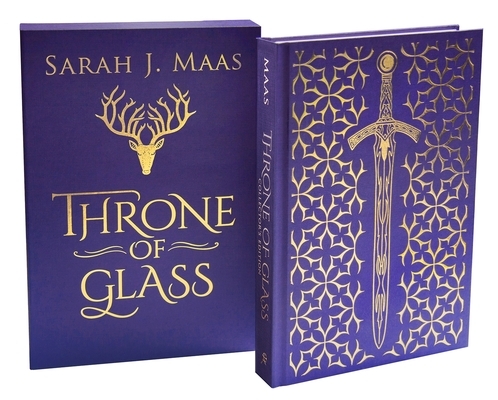 This must-have collectible edition of THRONE OF GLASS, the exciting first book in the New York Times bestselling series, features a deluxe package, brand new interior page designs, and more-perfect for Sarah J. Maas fans. This lush, one-of-a-kind edition of the book that started a world-wide phenomenon tells the sweeping saga of Celaena Sardothien who lives in a land without magic, where the king rules with an iron hand. Celaena is summoned to the castle-not to assassinate the king, but to win her freedom. If she defeats twenty-three killers, thieves, and warriors in a competition, she will be released from prison to serve as the king's champion. The Crown Prince will befriend her. The Captain of the Guard will protect her. But something evil dwells in the castle of glass-and it's there to kill. When her competitors start dying one by one, Celaena's fight for freedom becomes a fight for survival, and a desperate quest to root out the evil before it destroys her world. Now available in an all-new, deluxe package, the THRONE OF GLASS COLLECTOR'S EDITION features a cloth slipcase with unique foil art on the case and the book cover, a ribbon pull, beautiful brand-new interior page designs, metallic endpapers, and a new map of Erilea.